A death metal duo that combines two equally prolific players, namely Kam Lee and Jonny Petterson, Nattravnen could have easily just been a ‘here and gone’ release with the quantity of material both members tend to put out. But instead Nattravnen does something a little more. 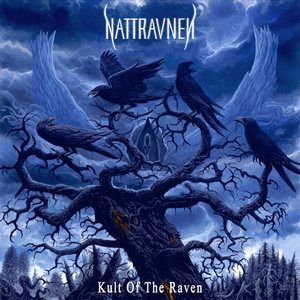 While it’s still entirely entrenched in death metal, some nuances poke their head through and make Kult of the Raven a memorable piece of extreme metal. As noted, Nattravnen sticks to plenty of traditional death metal traits that will draw in fans of either player. Lee’s vocals are certainly monstrous in tone, and the thundering riffs (of which many tend to tow the mid-tempo line) have enough catchiness to them while maintaining the steamroller effect necessary for a release like this. But the added attention to detail, such as the lyrics (spawned themselves from a story written by Lee) and black/doom influences give the band a sense of freshness amid the death metal template. The material is consistently dark, regardless of tempo, but effective thrusts into slow, doomy territory (“Return to Nevermore”) with nuanced synths backing it, brings the music to a whole new level. Even when the songs pulsate with blasts in speedier moments, they manage to keep that gothic darkness intact (“Suicidium, the Seductress of Death”) and use the synths to good measure without them ever commanding too much of the space reserved for the rest of the band. There’s much to enjoy about Nattravnen. The established players bring in a level of guaranteed heaviness to the project, but also are able to explore some darker and dreary atmospheres that much of their other work tends not to dabble in. Add in a sense of melody that keeps it memorable without taking too much of the limelight, and you have a formula for a very solid death metal release.